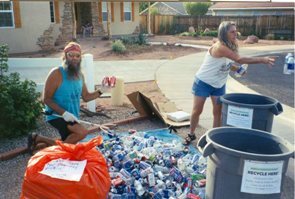 Since 2004, Moab Solutions staff, supporters, and volunteers have been collecting recyclable material including glass, cans, plastic and paper from dozens of sites throughout Moab for free. In one location, at one time, we had over 50 collection points! We did this because we wanted to demonstrate the large quantity of recyclables that were being thrown out, and we wanted to make recycling as easy for people as wasting. We still service a variety of non-profits, city and county sites, and some private businesses. Our goal is to enable these sites to begin recycling on their own so that recycling becomes as much a part of their routine as garbage collection, cleaning, and maintenance. We still pick up and/or maintain a handful of sites for free, including at the Grand County Sheriff's Office, Zion's Bank (newspaper only), the Moab Post Office, a site on the in-town parkway, and at a bike jump area. We hope to help these sites institutionalize recycling in the near future as well. The “Just say No! to plastic” Tote Bag Exchange was started circa 2009 in partnership with the Moonflower Community Cooperative, our local health food store. There are some hooks next to the box container, where people can use boxes for their shipping, where people can leave a bag or take a bag. We stock it with tote bags donated by the Moab thrift shop WabiSabi, along with the bags the public donates. The idea is to "Just say no to plastic" and encourage people to use reusable bags instead of single-use, disposable bags that often end up blowing around as litter, and often harming wildlife. We invite you to bring your extra bags to the bucket next time you shop at Moonflower. We know you have a few stashed in your closet! Status as of July 2017: Working with a talented group of women, we researched the current status of recycling across the community, then created a website, and some ads. We are working on an editorial and will soon launch www.moabrecycles.org to the community. We will place the ads, submit our editorial for publication, and offer some nice new recycle bins for people who express an interest in collecting recycling at their office or school/daycare center. Status as of February, 2019: due to a confluence of unfortunate events, our precious recycle center came close to the point of collapse. Moab Solutions starting volunteering at the center everyday for several months to keep the collection area prepared to accept material, clean up the grounds around the collection area, and greet and speak with the people bringing materials to the center. After a lot of hard work, the center is now in better shape than ever. Fully staffed with an incredible crew, they are expanding items accepted and looking for great ways to give the public the recycling experience they deserve. ​We will still launch the campaign, and create events to attract people to recycling and our dearly loved Community Recycle Center. It will just be a bit delayed!